September 16, 1920 - Horse-drawn wagon filled with explosives detonated near the subtreasury. Flames flooded Wall Street, shooting up nearly six-stories-high. The blast shattered windows around the area; 300 people were killed and a hundred more were wounded. The only famous financial figure to be injured was Junius Spencer, J.P. Morgan's grandson, who suffered a slight gash on one hand. June 6, 1934 - President Franklin Roosevelt signed the Securities Exchange Act; set of regulations designed to rein in the stock swapping shenanigans and duplicitous sales tactics that had riddled the New York Stock Exchange (NYSE) and helped spark the Great Crash of 1929; registration requirements for all exchanges and curbing stock purchases by cash-strapped traders, the legislation created the Securities Exchange Commission (SEC). December 30, 1970 - President Nixon signed The Securities Investor Protection Act of 1970; created Securities Investor Protection Corporation (SIPC), private nonprofit corporation to insure the securities and cash left with brokerage firms by investors against loss from financial difficulties or failure of such firms; first line of defense in the event a brokerage firm fails owing customers cash and securities that are missing from customer accounts. 1973 - Derivatives - Fisher Black, Myron Scholes published Black-Scholes Option Pricing Formula in Journal of Political Economy; specified first successful options pricing formula (mathematics of option pricing, dynamic hedging strategies using options and other derivatives); described general framework for pricing derivative securities, created financial engineering; one of most important mathematical tools in modem theory of finance (Black, F. and Scholes, M. . "The Pricing of Options and Corporate Liabilities". Journal of Political Economy, Vol. 86, p.637). 1997 - Black (posthumously), Scholes, Merton Miller awarded Nobel Prize in Economic Sciences "for a new method to determine the value of derivatives." 1974 - Michael Milken created market for high-yield bond trading; based on research of W. Braddock Hickman, former president of the Federal Reserve Bank of Cleveland (Corporate Bond Quality and Investor Experience, Princeton, NJ: Princeton University Press, 1958) - corporate default history 1900-1943: diversified long-term portfolio of non-investment-grade debt securities outperformed portfolio of investment-grade debt, with the same level of risk. April 1977 - Junk Bonds - Drexel underwrote first junk bond issue, Texas International; end of 1978 - Drexel number one issuer; used financial innovation as low-cost solution to raising capital; created high-yield new-issue bond market; 1981 - issued bonds for leveraged buyouts; 1983 - provided junk bond financing for hostile takeovers (leveraged buyouts taken against incumbent directors' will); March 1985 - completed first junk bond-financed hostile takeover. 1977 - LBOs - Kohlberg Kravis Roberts & Co. (formed in May 1, 1976 by former Bear Stearns executives Jerome Kohlberg, Henry Kravis, George Roberts) financed $26 million leveraged buyout of A.J. Industries, publicly-traded small manufacturer of brake drums and other components (66% leverage financed with senior bank debt); firms' first deal; couldn't persuade anyone to provide subordinated debt (first LBO done in 1963 - Lewis B. Cullman acquired Orkin Exterminating for $62.4 million with a $1,000 investment); May 14, 1979 - acquired Houdaille Industries in $355 million buyout; first public-to-private transaction (leveraged buyout of a publicly traded company); took almost one year to raise $355 million from several banks, insurance companies for deal with 86% leverage financed by multi-layered array of senior, subordinated securities. 1977 - Securitization - Salomon Brothers (Lewis S. Ranieri) and Bank of America Corp. (BAC ) developed first private (non-Government Sponsored Enterprise) mortgage-backed securities (MBS); bonds pooled thousands of mortgages, passed homeowners' payments through to investors (only 15 states recognized MBS as legal investments); created "securitization," converting of home loans into bonds that could be sold anywhere in world = capital markets as source of funds for housing, commercial real estate; 1999 - size of market was $678 billion (41.6% credit card receivables, 19.8% home equity loans, 11.8% auto loans); 1982 - developed "collateralized mortgage obligation" (repackaged pools of 30-year mortgages into collections of 2-, 5-, and 10-year bonds to sell to wide range of investors; seen as template for cutting costs); led effort to obtain federal legislation to support, build the market (Tax Reform Act of 1986). November 12, 1999 - President Bill Clinton signed Gramm-Leach-Bliley Act (Financial Services Modernization Act of 1999); named for Senator Phil Gramm (R-TX), Representative Jim Leach (R-IA), Representative Thomas J. Bliley, Jr. (R-VA); repealed restrictions on banks affiliating with securities firms contained in sections 20 and 32 of the Glass-Steagall Act. June 9, 2004 - SEC issued Final Rule on "Alternative Net Capital Requirements for Broker-Dealers That Are Part of Consolidated Supervised Entities"; permitted "a broker-dealer to use mathematical models to calculate net capital requirements for market and derivatives-related credit risk"; reduced amount of capital that had to underlie assets; allowed increased leverage. 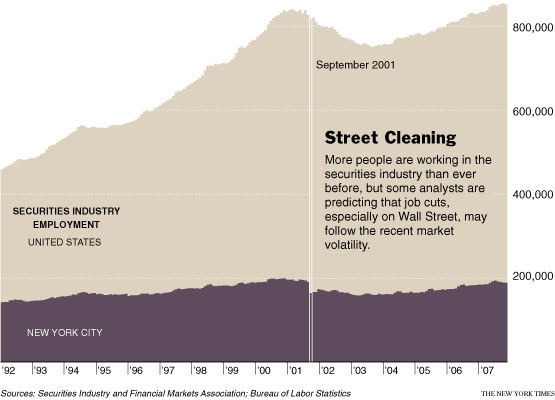 2006 (First Quarter) - Bureau of Labor Statistics data indicated average weekly pay for financial sector jobs in Manhattan was $8,323, up more than $3,000 per week in three years; 280,000 workers in financial sector collect more than half of all wages paid in Manhattan, hold less than 1/6 of 1.8 million jobs in the borough; New York City's dependence on Wall Street grows; unequal distribution of income gains squeezing middle class. March 2, 2007 - The Director of the National Park Service announced the Wall Street Historic District (all or part of 36 blocks in lower Manhattan), roughly bounded by Cedar St. and Maiden's Lane, Pearl St., Bridge and S. William St., and Greenwich St. and Trinity Pl., had been added to the National Register of Historic Places (the nation's official list of cultural resources worthy of preservation); area contains 65 historic buildings and sites (21 had previously been listed individually in national register, 29 had been designated as landmarks by the NYC Landmarks Preservation Commission); new buildings added include the New York Stock Exchange, Federal Hall, Trinity Church, U.S. Custom House , American Bank Note Building and the Equitable Building. (Returns), Roger G. Ibbotson, Rex A. Sinquefield (1989). Stocks, Bonds, Bills, and Inflation: Historical Returns (1926-1987). (Homewood, IL: Dow Jones-Irwin, 202 p.). Stocks--Prices--United States; Securities--Prices--United States; Stock price forecasting. (Returns), Elroy Dimson, Paul Marsh, Mike Staunton (2001). Triumph of the Optimists: 101 Years of Global Investment Returns. (Princeton, NJ: Princeton University Press, 399 p.). London Business School. More data, extending farther back in time and covering more countries than CRSP (Center for Research in Securities Prices) - annual real and nominal returns on equities, bonds, and bills, as well as GDP, inflation, and exchange rate data, over 101 years (1900-2000) for sixteen countries in North American and Europe plus Australia, South Africa, and Japan (Australia, Belgium, Canada, Denmark, France, Germany, Ireland, Italy, Japan, Netherlands, South Africa, Spain, Sweden, Switzerland, United Kingdom, and United States. (SEC), Rudolph Leo Weissman (1939). The New Wall Street. (New York, NY: Harper, 308 p.). First President of Financial Analysts of Philadelphia, Inc. United States. Securities and Exchange Commission; Securities --United States; Stock exchanges --United States; Wall Street (New York, N.Y.). (SEC), Hillel Black (1962). The Watchdogs of Wall Street. (New York, NY: Morrow, 241 p.). New York Stock Exchange; United States. Securities and Exchange Commission; Securities --United States. (SEC), Ralph F. De Bedts (1964). The New Deal's SEC: The Formative Years. (New York, NY: Columbia University Press, 226 p.). Associate Professor of History (Old Dominion College). United States. Securities and Exchange Commission. (SEC), Michael E Parrish (1970). Securities Regulation and the New Deal. (New Haven, CT: Yale University Press, 270 p.). Teaches 20th-Century American History (University of California, San Diego). New Deal, 1933-1939; Securities --United States; United States --Economic policy --1933-1945. (SEC), Homer Kripke (1979). The SEC and Corporate Disclosure: Regulation in Search of a Purpose. (New York, NY: Law & Business, Inc., 368 p.). Chester A. Rohrlich Professor of Law at New York University. United States. Securities and Exchange Commission; Stockholders --Legal status, laws, etc. --United States; Disclosure of information --Law and legislation --United States. (SEC), Susan M Phillips, J. Richard Zecher (1981). The SEC and the Public Interest. (Cambridge, MA: MIT Press, 177 p.). Commissioner, Commodity Futures Trading Commission; Former Director of Policy Research at the SEC. United States. Securities and Exchange Commission. Role of SEC best viewed as broker balancing strongly competing groups in securities industry; extent to which premises on which SEC was founded still apply; three areas in depth: deregulation of fixed commission rates, development of national market system, corporate disclosure system. (SEC), Roberta S Karmel (1982). Regulation by Prosecution: The Securities and Exchange Commission Vs. Corporate America. (New York, NY: Simon and Schuster, 400 p.). Centennial Professor of Law Education (Brooklyn Law School). United States. Securities and Exchange Commission; Securities --United States. (SEC), Joel Seligman (1985). The SEC and the Future of Finance. (New York, NY: Praeger, 378 p.). Professor (George Washington University Law School). United States. Securities and Exchange Commission; Stock exchanges --Law and legislation --United States; Securities --United States; Disclosure of information --Law and legislation --United States. (SEC), David A Vise, Steve Coll (1991). Eagle on the Street: Based on the Pulitzer Prize-Winning Account of the SEC's Battle with Wall Street. (New York, NY: Scribner's, 395 p.). Reporters (Washington Post). United States. Securities and Exchange Commission --Officials and employees; Securities industry --Corrupt practices --United States; Securities fraud --United States. History of Securities and Exchange Commission (SEC), its chairman John Shed during 1980s; deregulatory heyday of Reagan Administration, height of insider trading scandals. (SEC), Anne M Khademian (1992). The SEC and Capital Market Regulation: The Politics of Expertise. (Pittsburgh, PA: University of Pittsburgh Press, 278 p.). United States. Securities and Exchange Commission; Capital market --Law and legislation --United States; Securities --United States; Legislative oversight --United States. (SEC), Robert E Herman (1992). A Study of the Securities and Exchange Commission Governance and the Public Interest, 1969-1972. (New York, NY: Garland Pub, 343 p.). United States. Securities and Exchange Commission; Securities --United States. (SEC), Stuart Banner (1998). Anglo-American Securities Regulation: Cultural and Political Roots, 1690-1860. (New York, NY: Cambridge University Press, 318 p.). Professor of Law ( UCLA Law School). Securities --United States --History; Securities --Great Britain --History. Regulation of earliest securities markets in England, United States, from origins in 1690s until 1850s; complex, moderately effective body of regulatory control already extant during reign of Queen Anne; reflected widespread Anglo-American attitudes toward securities speculation; how popular thought about securities market translated into regulation; how regulation influenced market structures, activities of speculators. (SEC), Joel Seligman (2003). The Transformation of Wall Street: A History of the Securities and Exchange Commission and Modern Corporate Finance. (New York, NY: Aspen Publishers, 934 p.[3rd ed.]). Dean and Ethan A.H. Shepley University Professor at the Washington University School of Law. United States. Securities and Exchange Commission -- History; Corporations -- United States -- Finance -- History. Origins, accomplishments, failings of SEC, its leaders - from creation in 1934 until 2001, end of Arthur Levitt's Chairmanship. (SEC), Richard C. Sauer (2010). Selling America Short The SEC and Market Contrarians in the Age of Absurdity. (Hoboken, NJ: Wiley, 324 p.). Former Assistant Director with the U.S. Securities and Exchange Commission. Sauer, Richard; United States. Securities and Exchange Commission; Stock exchanges --United States; Finance --Corrupt practices --United States; Fraud investigation --United States. Crooked companies, financial philanderers, hapless enforcers; illusory asset valuations, myopic business strategies, feckless public policies; damage wrought by deep biases, lack of worldly experience common among those who hold reins of capital markets: 1) inner workings of financial system; 2) rogue's gallery of crooked executives, professional fraud enablers, squirrelly technocrats; 3) ways contrarian views of public companies are suppressed, punished, deprive market of critical information. Daniel M. Abramson (2001). Skyscraper Rivals: The AIG Building and the Architecture of Wall Street. (New York, NY: Princeton Architectural Press, 207 p.). AIG Building (New York, N.Y.); 40 Wall Street (New York, N.Y.); One Wall Street (New York, N.Y. : 1931- ); 20 Exchange Place (New York, N.Y.); Skyscrapers--New York (State)--New York; Art deco (Architecture)--New York (State)--New York; Wall Street (New York, N.Y.)--History--20th century; New York (N.Y.)--Buildings, structures, etc. Architecture of Wall Street between wars through an amazing array of contemporary and archival images and an informed discussion of financial, geographical, historical forces that shaped this district. Peter L. Bernstein (1992). Capital Ideas: The Improbable Origins of Modern Wall Street. (New York, NY: Free Press, 340 p.). Finance; Wall Street. Breakthrough financial theories of small group of academics laid intellectual groundwork for many innovations, new products, strategies which revolutionized world of finance. --- (2007). Capital Ideas Evolving: The Improbable Origins of Modern Wall Street. (Hoboken, NJ: Wiley, 288 p.). Finance; Investments. History of modern investment theory, history of modern financial innovation. Financial theories now: 1) shape underlying structure of portfolio management, market behavior, 2) spark important innovations (portable alpha, fresh insights into risk/return trade-off); positive consequences of interactions between theoretical critics and investment practitioners. Murray T. Bloom (1971). Rogues to Riches; The Trouble with Wall Street. (New York, NY: Putnam, 332 p.). Wall Street. John Brooks (1961). The Seven Fat Years : Chronicles of Wall Street. (Garden City, NY: Doubleday, 238 p. [orig. pub. 1958]). Finance--United States--History; Stock exchanges--United States. David Colbert (2001). Eyewitness to Wall Street: 400 Years of Dreamers, Schemers, Busts, and Booms. (New York, NY: Broadway Books, 391 p.). Wall Street; Capitalists and financiers -- United States -- History; Securities -- United States -- History; Finance -- United States -- History. Charles A. Conant (1968). Wall Street and the Country, a Study of Recent Financial Tendencies. (New York, NY: Greenwood Press, 247 p. [orig. pub. 1904]). Trust companies; Trusts, Industrial; Currency question -- China; United States -- Commerce; Economic history; Stock exchanges. Cathy Courtney; foreword by Asa Briggs and an introduction by Paul Thompson (1996). City Lives: Changing Voice of British Finance. (London, UK, Merthuen, 320 p.). Freelance Writer and Oral Historian. Capitalists and financiers -- England -- London -- Interviews; Finance -- Great Britain -- History; Financial institutions -- Great Britain -- History; Financial institutions; London (England). Transformation of one of world's major financial capitals; contrast between old system of mutual trust with demanding struggle with today's unstable global markets. Gerald F. Davis (2009). Managed by the Markets: How Finance Has Reshaped America. (New York, NY: Oxford University Press, 304 p.). Wilbur K. Pierpont Collegiate Professor of Management at the Ross School of Business (University of Michigan). Capital market --United States --History --21st century; Business cycles --United States --History --21st century; United States --Economic conditions --2001-. Finance-driven American society; how finance has replaced manufacturing at center of American economy over past three decades; how new finance-centered system works, how we got here, what challenges lay ahead; evolution from industrial to postindustrial society; 1900-1930 - era of financial capitalism; 1930-1980 - era of managerial capitalism - Americans looked to corporation, long-term savings to provide them with security; 1980s- takeovers, financial move to high risk savings, late 1990s - deregulation and corporate scandals - Americans became disillusioned with corporation as source of lifetime employment and retirement capital, relied on financial markets for security, wealth creation; ownership society (George W. Bush) - when individuals see themselves as free agent investors, consequences for society can be dire; new investor society; since early 1980s - finance and financial considerations have increasingly taken center stage, dramatically reshaped American society: 1) corporations focus on creating shareholder value, personnel practices no longer provide secure employment, economic mobility, health insurance, retirement benefits; 2) employees must become shareholding free-agents, left to their own fate; 3) banking shifted from traditional role of taking in deposits, making loans to widespread use of "securitization", turned loans (mortgages, corporate debt) into bonds owned by institutional investors; 4) financial services industry more concentrated among large banks and mutual funds, yet more spread out among under-regulated specialists (mortgage finance companies, hedge funds); 5) states act as "vendors" in global marketplace of law, emulate firms such as Nike, hire contractors to do much of work of government; 6) individuals, households find welfare tied to stock market, mortgage market as never before; 7) turbulence of recent years underscores dangers of depending too much on financial markets. Steve Fraser (2005). Every Man a Speculator: History of Wall Street in American Life. (New York, NY: HarperCollins, 752 p.). Wall Street--History; Stock exchanges; Stocks; Securities. --- (2008). Wall Street: America’s Dream Palace. (New Haven, NY: Yale University Press, 200 p.). Senior Lecturer (University of Pennsylvania), Co-Founder of the American Empire Project, Metropolitan Books. Capitalists and financiers--United States--Biography; Wall Street (New York, N.Y.)--History. America’s love-hate relationship with Wall Street; four iconic, recurring Wall Street types: 1) aristocrat, 2) confidence man, 3) hero, 4) immoralist; how nation has wrestled, wrestles with fundamental questions of wealth and work, democracy and elitism, greed and salvation. Martin S. Fridson (1998). It Was a Very Good Year: Extraordinary Moments in Stock Market History. (New York, NY: Wiley, 244 p.). Merrill Lynch Junk Bond Department. Investments--United States--History; Stocks--United States--History. Robert Gambee (1990). Wall Street Christmas. (New York, NY: Norton, 272 p.). Christmas--New York (State)--New York; Stock exchanges--New York (State)--New York; Wall Street (New York, N.Y.)--Social life and customs; New York (N.Y.)--Social life and customs. --- (1999). Wall Street: Financial Capital. (New York, NY: Norton, 272 p.). Wall Street (New York, N.Y.)--History--Pictorial works; Wall Street (New York, N.Y.)--History; Business enterprises--New York (State)--New York--History--Pictorial works; New York (N.Y.)--History--Pictorial works; New York (N.Y.)--Buildings, structures, etc.--Pictorial works. Charles R. Geisst (1990). Visionary Capitalism: Financial Markets and the American Dream in the Twentieth Century. (New York, NY: Praeger, 191 p.). Capital market--United States--History--20th century; Finance--United States--History--20th century; Capitalism--United States--History--20th century. --- (1997). Wall Street: A History. (New York, NY: Oxford University Press, 404 p.). Professor of Finance (Manhattan College School of Business). Wall Street--History. --- (1999). 100 Years of Wall Street. (New York, NY: McGraw-Hill, 178 p.). Professor (Manhattan College). Wall Street (New York, N.Y.)--History--20th century. Author of "Wall Street: A History," takes a picturesque look at the history of Wall Street. --- (2004). Wall Street: A History: From Its Beginnings to the Fall of Enron. (New York, NY: Oxford University Press, 438 p. [rev. and exp. ed.]). Professor of Finance (Manhattan College School of Business). New York Stock Exchange; Wall Street--History. --- (2005). Undue Influence: How the Wall Street Elite Put the Financial System at Risk. (Hoboken, NJ: Wiley, 314 p.). Professor of Economics and Finance (Manhattan College). Stock exchanges--United States; Stock exchanges--Law and legislation--United States; Securities industry--Deregulation--United States; Financial crises--United States. John Steele Gordon (1999). The Great Game: The Emergence of Wall Street as a World Power, 1653-2000. (New York, NY: Scribner, 319 p.). Wall Street--History; Securities--United States--History; Investments--United States--History. Karen Ho (2009). Liquidated: An Ethnography of Wall Street. (Durham, NC: Duke University Press, 392 p.). Associate Professor of Anthropology (University of Minnesota). Securities industry --United States --Employees; Stockbrokers --United States; Investment banking --United States; downsizing of organizations --United States. How financial markets are constructed; how financially dominant, highly unstable market system is understood, justified, produced through restructuring of corporations, larger economy; bankers’ approaches to financial markets, corporate America inseparable from structures, strategies of their workplaces; based on culture of liquidity, compensation practices tied to profligate deal-making; culture of Wall Street often obscured by triumphalist readings of capitalist globalization. Harland W. Hoisington, Sr. (1972). Wall Street, 1920-1970; Five Fabulous Decades. (New York, NY: Vantage Press, 207 p.). Wall Street. Sidney Homer and Richard E. Sylla (1996). The History of Interest Rates. (New Brunswick, NJ: Rutgers University Press, 3rd ed., rev. ; 688 p.). Academics (NYU). Interest Rates, Credit. Classic. Jane Elizabeth Hughes, Scott B. MacDonald (2004). Carnival on Wall Street: Global Financial Markets in the 1990s. (New York, NY: Wiley, 258 p.). Capital market--History--20th century; International finance--History--20th century; Stock exchanges--History--20th century; Wall Street--History--20th century; Bull markets--United States--History--20th century; Stock Market Bubble, 1995-2000; Financial crises--East Asia--History--20th century; Globalization--Economic aspects--History--20th century. David Kynaston (1995). The City of London: World of Its Own 1815-1890 v.1. (London, UK, Pimlico, 512 p.). Professional Historian. City of London--History. City's 19th century ascent to position as world's leading international financial centre; rise of merchant banks, growth of Stock Exchange, internationalism of money market, characters behind these developments (mercurial Nathan Rothschild, dour Joshua Bates, who consolidated power of Barings); 1838 - burning of Royal Exchange on snowy night; hectic making of fortunes from South American guano; 1890 - Baring crisis (city's most respected house rescued by keenest rival); mainstream of British and international history. --- (1995). The City of London: Golden Years, 1890-1914 v. 2. (London, UK, Chatto & Windus, 688 p.). Professional Historian. City of London--History. London dominant, as Britain's legendary gold-standard reigned supreme across globe; how possible; how relationship between finance, politics became dangerously close; The Stock Exchange, muscular, rumour-ridden club of gentlemen and would-be gentlemen, brought to life in incidents like Marconi scandal, Battle of Throgmorton Street", murder of stockbroker by his mistress on Lord Mayor's day; city in action in summer of 1914 - sweating over deals, looking to short term, never dreaming would shortly change forever. --- (2000). The City of London: Illusions of Gold, 1914-45 v. 3. (London, UK, Pimilco, 581 p.). Professional Historian. City of London--History. Period covering two world wars, return to gold standard, Wall Street Crash, 1930s' depression - City sought to regain pre-1914 dominance over international finance, found itself increasingly overwhelmed by leverage exerted by New York, by politicians anxious for votes, by trade unions, by provincial industrialists; anecdote, vignette, character sketch (eminent bankers such as Lord Revelstoke of Barings, cads and schemers like Clarence Hatry); Montagu Norman, Governor of the Bank of England from 1920 to 1944. --- (2002). The City of London: Club No More, 1945-2000 v. 4. (London, UK, Pimilco, 640 p.). Profession Historian. City of London--History. Fourth, final volume of epic history of square mile in modern era - from post-war era (City hemmed in by bombsites, austere Chancellors) to recent developments ("Big-Bang" deregulation of 1986); social history, financial study, discussions of changing class, sexual complexion of City, early computerisation of big companies; colourful characters, dramatic boardroom struggles, heated exchanges between politicians and bankers; comparison of Stock Exchange to acqueduct; evidence of share-dealing, pensions, derivatives scandals (Robert Maxwell, Nick Leeson); only City, never any individual within it, to blame. Leonard L. Levinson (1961). Wall Street; A Pictorial History. (New York, NY: Ziff-Davis, 376 p.). New York (N.Y.)--Streets--Wall street; Wall Street (New York, N.Y.); United States--Economic conditions. Ralph G. Martin and Morton D. Srone (1960). Money, Money, Money; Wall Street in Words and Pictures. (Chicago, IL: Rand McNally, 221 p.). New York Stock Exchange; Finance--New York (State)--New York. Ranald C. Michie (1992). The City of London: Continuity and Change, 1850-1990. (Basingstoke, Hampshire (UK): Macmillan Academic and Professional, 238 p.). Financial institutions--England--London--History; London (England)--History--1800-1950; London (England)--History--1951-. Alexander Dana Noyes (1938). The Market Place; Reminiscences of a Financial Editor. (Boston, MA: Little, Brown, 384 p.). Finance -- United States -- History; United States -- Politics and government -- 1865- ; Journalists -- Biography. Nomi Prins (2004). Other People's Money: The Corporate Mugging of America. (New York, NY: New Press, 342 p.). Former Managing Director (Goldman Sachs, Bear Stearns). Investment banking Moral and ethical aspects United States; Corporations Moral and ethical aspects United States; Corporations Corrupt practices United States; Stock Market Bubble, 1995-2000; Capital market United States History 20th century. Fred Schwed. Illustrated by Peter Arno (1940). Where Are the Customers' Yachts? or, A Good Hard Look at Wall Street. (New York, NY: Simon & Schuster, 215 p.). Wall Street; Investments; Speculation. Wall Street, 1927-1940. Lois Severini (1983). The Architecture of Finance: Early Wall Street. (Ann Arbor, MI: UMI Research Press, 237 p.). Public buildings--New York (State)--New York; Financial institutions--New York (State)--New York--Buildings; Wall Street (New York, N.Y.)--History. Robert M. Sharp (1989). The Lore and Legends of Wall Street. (Homewood, IL: Dow Jones-Irwin, 246 p.). Wall Street--History. B. Mark Smith (2001). Toward Rational Exuberance: The Evolution of the Modern Stock Market. (New York, NY: Farrar, Straus and Giroux. Stock exchanges--United States; Stocks--United States. --- (2003). The Equity Culture: The Story of the Global Stock Market. (New York, NY: Farrar, Straus and Giroux, 344 p.). Stock exchanges; Stocks; Securities. Andrew Smithers (2009). Wall Street Revalued: Imperfect Markets and Inept Central Bankers. (Chichester, West Sussex, UK: Wiley 246 p.). Founder of Smithers & Co. Capital market --United States; Monetary policy --United States; Finance --United States; Banks and banking, Central --United States. New way to value asset prices; root cause of current crisis - indifference to overvalued asset prices by investors, central banks, much of financial press; how assets can be valued, shows how much incorrect, inaccurate information is published on subject, how to spot this; how asset prices affect economy, how central banks lose their ability to stabilise it when bubbles collapse; new model for understanding limited efficiency of financial markets, key condition for improving investment, economic management today. Antony C. Sutton (1974). Wall Street and the Bolshevik Revolution. (New Rochelle, NY: Arlington House, 228 p.). Former Economics Professor (California State University Los Angeles). Investments, American --Soviet Union; United States --Foreign economic relations --Soviet Union; Soviet Union --Foreign economic relations --United States; Soviet Union --History --Revolution, 1917-1921. Covert politics, economics in twentieth century; Wall Street executives worked to uphold new Soviet regime; first volume of a trilogy. Antony C. Sutton (1975). Wall Street and FDR. (New Rochelle, NY: Arlington House Publishers, 200 p.). Former Economics Professor (California State University Los Angeles). Roosevelt, Franklin D. (Franklin Delano), 1882-1945; Securities industry --United States; United States --Politics and government --1933-1945; United States --Economic policy --1933-1945; Wall Street (New York, N.Y.)--Biography--Pictorial works. Second volume of trilogy. Antony C. Sutton (1976). Wall Street and the Rise of Hitler. (Seal Beach, CA: ’76 Press, 220 p.). Former Economics Professor (California State University Los Angeles). Investments, American --Germany --History; United States --Foreign economic relations --Germany; Germany --Foreign economic relations --United States; Germany --History --1933-1945. Covert politics and economics in the twentieth century. Wall Street financed rise to power of National Socialist German Workers Party; perceived government-guaranteed profits, contractor relationship in inevitable socialism; third volume of a trilogy. Bob Tamarkin and Les Krantz (1999). The Art of the Market: Two Centuries of American Business as Seen Through Its Stock Certificates. (New York, NY: Stewart, Tabori & Chang, 176 p.). Award-winning Journalist, Respected Art Editor. Stock certificates--United States--History; Industries--United States--History. Dana Lee Thomas (1967). The Plungers and the Peacocks: An Update of the Classic History of the Stock Market. (New York, NY: Morrow, 384 p.). Wall Street (New York, N.Y.) -- History. Robert I. Warshow (1929). The Story of Wall Street. (New York, NY: Greenberg, 362 p.). Wall Street; Speculation; Capitalists and financiers--United States..). Louise Yamada (1998). Market Magic: Riding the Greatest Bull Market of the Century (New York, NY: Wiley, 252 p.). Wall Street -- History -- 20th century; Stock exchanges -- United States -- History -- 20th century; Stock exchanges -- History -- 20th century; Economic history -- 1945-. This exhibit features samples of the "Pepper...and Salt" cartoons that appeared in the Wall Street Journal starting in the 1950s. The cartoons are accompanied by brief essays about the business world and financial conditions of the decades in which they appeared. Also includes a brief history of the cartoon feature, a note on the feature from its founder, and a reading list. From the Baker Library at the Harvard Business School. July 1987 - The Ward M. Canaday Center for Special Collections (University of Toledo) received the Hess Collection, a bequest of Dr. Nicholas Gimbel. Originally, these books were collected by Gimbel's father who was a partner in the New York brokerage firm Birdsall & Hess. Consists of books on the history of a variety of financial markets (stock, commodity, bond, etc. ), fiction, biography, humor, and even works denouncing the stock market altogether. Perhaps the strongest area of concentration in this collection is made up of books on "technical analysis." The nation's only independent public museum dedicated to celebrating the spirit of entrepreneurship and the democratic free market tradition which have made America the financial capital of the world. Founded in 1988, the Museum was chartered as an educational institution. Today, the Museum is committed to helping all Americans look to the lessons of financial history, while taking charge of their own financial lives. The Museum showcases the history of Wall Street, the economic miracle of the markets, and the achievements of American businessmen and women from Alexander Hamilton's founding designs for a national economy, to the rise of "dot com" entrepreneurs in the global "new economy." This Virtual Museum & Archive of the SEC and the Securities History (independent of and separate from the U.S. Securities and Exchange Commission) preserves and shares the history and historic records of the U.S. Securities and Exchange Commission and of the securities industry from the 1930s to the present. It includes a wide range of primary materials, including a timeline, papers, photos, oral histories and original programs broadcast from this site, which contribute to the understanding of how the SEC has shaped and continues to shape U.S. and international capital markets. The Thomas Willing Institute for the Study of Financial Markets, Institutions, and Regulations (TWI, for short) was founded in 2010; mission is to increase financial history literacy.